Whether you’re still thinking of buying the Canon EOS 5D Mark III or you already own the camera, nothing beats reading the owner’s manual cover-to-cover to get a comprehensive understanding of operating the camera, camera settings, features and the available range of functionality. Canon EOS 5D Mark III Instruction Manual — 28.17 MB, 404 pages. 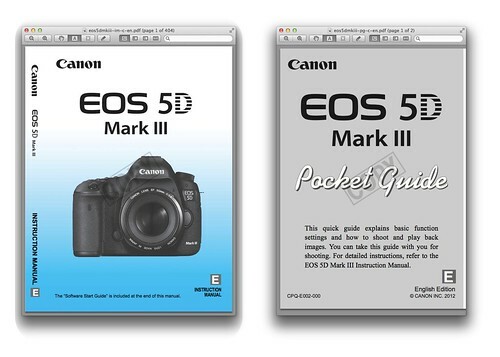 Canon EOS 5D Mark III Pocket Guide — 1.46 MB, 2 pages. If the direct download links didn’t work for you, visit Canon USA’s official Brochures & Manuals page for the 5D Mark III and download from there. You’ll also find related software manuals. The manuals are not password-protected, so you are able to print them. There is a “Copy” watermark displayed on every page though, and you cannot copy text from the PDFs without a password, which Canon doesn’t reveal. Information on remote control units that can be used with the 5DM3 can be found on pages 185 through 186. They are Remote Switch RS-80N3, Timer Remote Controller TC-80N3 and RC-6 Wireless Infrared (IR) Remote. You might also want to consider third-party Canon-compatible radio-frequency (RF) wireless remote shutter solutions. Read the following articles on Phottix Cleon C8, a wireless RF (radio frequency) remote shutter release, Phottix Nikos, Phottix Cleon II and Phottix Plato to get an idea of how third-party remote switches may be useful for your requirements.